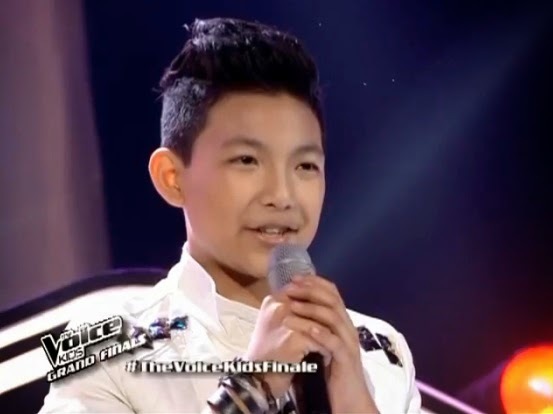 Manila, Philippines - Team Sarah's young artist Darren Espanto sang "You Are My Song" on the Grand Finals Special Performance with Celebrity Guest Round of ABS-CBN's top-rating and Twitter-trending vocal competition 'The Voice Kids' Philippines on Sunday, July 27, 2014 at the Newport Performing Arts, Theater, Resorts World Manila, Newport City, Pasay City. The 12-year-old kid from Calgary, Alberta performed a duet song with the Concert King Martin Nievera. "Congrats Darren. Ngayong gabi karapat-dapat ka talagang tawagin na 'The Voice Kids Grand Champion", Coach Sarah said. Aside from Darren, other artists fighting for the grand title are Team Lea’s Darlene Vibares, Team Bamboo’s Juan Karlos Labajo and Team Sarah’s Lyca Gairanod. The winner of 'The Voice Kids' will be named based from the outcome of the public's votes - text and online votes. The artists who will get the highest percentage of votes from the public will be the first-ever 'The Voice Kids' grand champion. The “The Voice Kids” grand champion will win P1 million, a one-year recording contract from MCA Universal, house and lot, a home appliance showcase, a musical instrument showcase, and P1 million worth of trust fund. Text VOICE DARREN and send to 2331 for ABS-CBN Mobile, Globe, TM and Sun Cellular subscribers and 231 for Smart and Talk 'N Text subscribers. The tariff is P1.00/vote for ABS-CBN Mobile, P2.50/vote for Globe, TM, Smart and Talk 'N text and P2.00/vote for Sun Cellular subscribers. Note: One vote per artist per SIM per round only. To vote online, go to http://thevoice.abs-cbn.com/vote. Log-in using valid email account. Enter PIN code of your ABS-CBN vote card and select name of artist (Darren). Tariff is P5 per vote. Note: 5 votes per artist per email account per day only. The finale episode on Sunday tops online conversations with '#TheVoiceKidsChampion' and '#TVKDarrenForTheChampion' among the trending topics.